The White House stood by Attorney General Jeff Sessions on Thursday as the administration became engulfed in yet another controversy over its links to Russia. 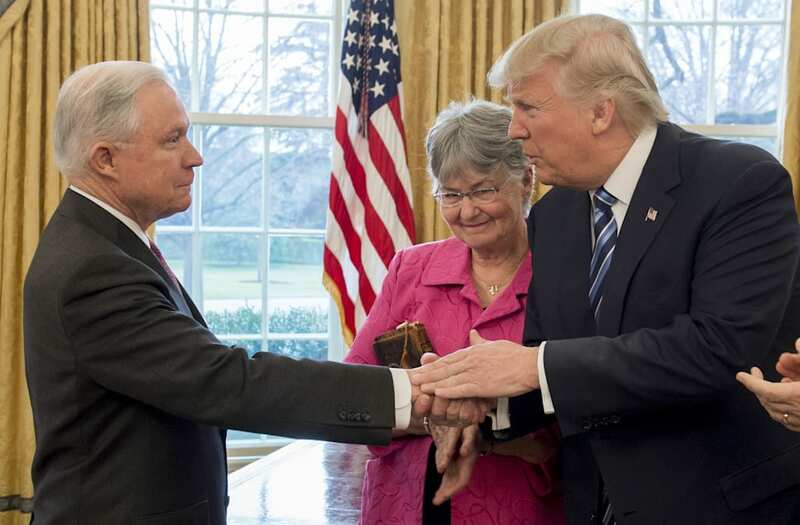 President Donald Trump said he had "total" confidence in Sessions, despite a report in The Washington Post that revealed previously undisclosed meetings last year between Sessions and Russia's ambassador to the U.S. The remark, reported by a White House pool reporter, came ahead of Trump's scheduled remarks Thursday afternoon aboard the USS Gerald R. Ford in Newport News, Virginia. Earlier, White House press secretary Sean Spicer, appearing on "Fox & Friends," declared the controversy a "false narrative" being pushed by Democrats for "political purposes" and maintained that Sessions had been "100 percent straight" with the Senate Judiciary Committee during his confirmation process. "He was asked very pointedly whether or not there had been any contact with the Trump campaign in the capacity of him being a surrogate. There was not. He was 100 percent straight with the committee," Spicer said during the interview. The revelations about Sessions' meetings with Russian Ambassador Sergey Kislyak emerged Wednesday night, when The Washington Post reported that Sessions – then a Republican senator from Alabama and Trump campaign surrogate – had not disclosed a pair of one-on-one conversations with Kislyak in July and September of last year, just as Russia's cyber campaign to interfere in the U.S. election was reaching its zenith. Sessions was the first sitting senator to endorse Donald Trump for president. During his Jan. 10 confirmation hearing, Sessions was asked by Sen. Al Franken, D-Minn., how he would react if he learned that anyone associated with the Trump campaign communicated with Russia during the campaign. The then-senator responded, "I'm not aware of any of those activities." later adding, "I have been called a surrogate at a time or two in that campaign and I did not have communications with the Russians." Asked in a subsequent written question whether he had been "in contact with anyone connected to any part of the Russian government about the 2016 election, either before or after election day," Sessions replied, "No." Spicer, in his interview Thursday, however, characterized the questions differently. "The testimony and the question he was asked was whether or not he was aware of Trump campaign officials doing something in their capacity as campaign officials," the press secretary said. "That answer is consistently no." "He did acknowledge that he met in his capacity as a United States senator on the Armed Services Committee with the ambassador on a couple of occasions, one being after he had given a speech and someone approached him," the press secretary said. In the clips made public by "Fox & Friends," he did not specify when or to whom those disclosures occurred.